Set of 4 (2 front, 2 rear) Stainless Steel Wheel Simulators for 2007 - 2018 Sprinter 2500 models (single rear wheels) with 16 inch wheels. Made in USA. Owner of Speedy Plumbing Service Inc. 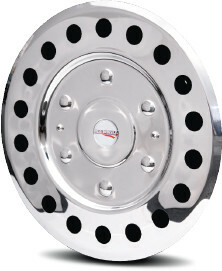 The wheel covers look great!, well worth the money.